The third running of this event was to be much the same as previous years with just a few minor tweaks. Clive and Ann Fletcher were the first to arrive (again) complete with their trailer and bikes that had not been unloaded since their last 13 day jolly that saw them doing the East to West Adventure. They parked next to the electric point and were left in charge. Hastings Luke was next to arrive; then Nick Perry (Felixstowe), up for his first taste of the event. Then Martin and Sharon arrived having come straight from East to West Adventure via the Isle of Man. Locals Ian and Matthew arrived which made eight riders with one pillion for the first run of the weekend. Ian’s Bantam didn’t want to play. I went home for a new plug, it started up, and we eventually set off. A short leg to Thune where it is customary to have a photo shoot. Then Ian’s bike didn’t want to start again. Eventually, after an open up of the points, it started. An incident-free run to Stokesby where a swift half is normally taken but was just a quick photo this year as we were running late. Ormesby chippy was shut as were most of Hemsby’s (par for the course and I will have to think of a new name for this run). Ian had peeled off and gone home but came back on his Yamaha to meet us just as we found somewhere to eat. With our lights on, we rode back to the Victoria Inn for liquid refreshment. Ian and Matthew had other commitments but we were joined by Jim, Phillip, Rod and Keith Backhouse (first visit) from Suffolk which made 10 plus 1. A day out was planned (actually it was basically the same as two years ago). Luke stuck with the Italjet and we set off with him being second man (this works on runs where the slowest bike sits behind the leader) and the rest following, there were no route sheets. 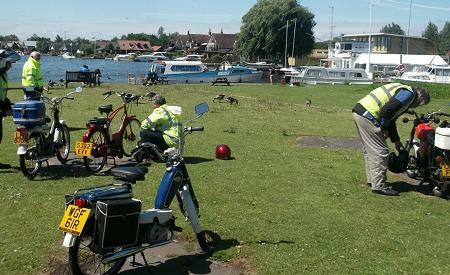 A bit of a deviation for a leg stretch by the river at Horning was enjoyed. Followed by another at Buxton Mill then on to Booton church, then a short run to Whitwell Station where refreshments were taken. 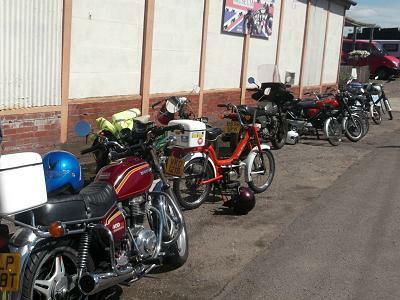 Keith Ashby joined us for the run up to North Walsham; all was going well until we were skirting Aylsham on the main road when Luke’s bike ran out of petrol, he had some with him but it played up the rest of the way to North Walsham and our visit to the Motorcycle Museum. George was away on his hols and his son Stephen gave some very generous entry discounts for those that wanted to go in, some stayed outside in the sun and Luke sorted his bike. Rod (note: on his Hondamatic, which copes well with moped speeds) and Keith bid us farewell and we headed to the coast for ie creams and then returned to Martham. A comfort break and then we were off again to the Lacons Arms, Hemsby (rebranded LA) for a nice evening meal. Heading for the entertainment on the green, five of use strayed into the Kings Arms where we were joined later on by Nick, Matthew and Ian. No Jim, Phillip or Rod but delighted to see not just a new Norfolk member for the first time (I had met him before but not with bikes) but a new member with a fresh Cyclemaster. The early birds had sorted Luke’s scooter but it wasn’t used. A prompt start and just a short slow-ped (Cyclemaster speed) run to a new breakfast location by the beach at Winterton-on-Sea. We proceeded to Great Yarmouth but, unfortunately, the Cyclemaster popped and backfired to a stop. A bit of tinkering and we set off again but didn’t get far and it was suggested that Mick headed back to Martham and we carry on. 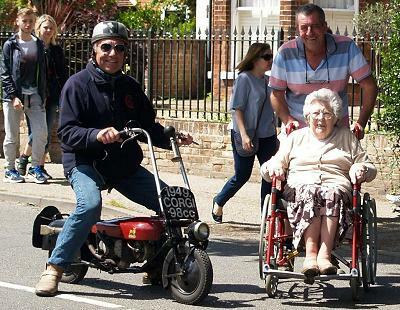 After a bit of weaving through the choc-a-bloc traffic heading for the sea front, we parked our bikes in the cycle rack and spent an hour and a quartet looking at the many American, classic, and custom cars on show. A quick blast (well Italjet speed) back to Martham and I convinced the others to stay and give me a wave riding my Corgi in the carnival procession. Unfortunately, it didn’t make it under its own steam (cooked the clutch) and was scooted along out of gear when Jeff came by with mother. Martin push-started me off again and much fun was had riding through the crowds. It’s a bit disappointing that more members didn’t attend, 15 in total over the three days. Big thanks to Clive & Ann, Martin & Sharon, and Luke for travelling long distances and the Suffolk five; I hope everybody enjoyed themselves as much as I did on the last of the Norfolk Camping weekends.